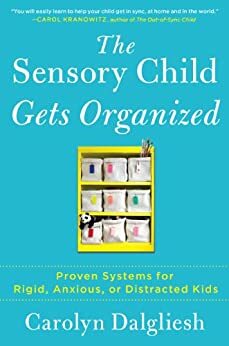 In The Sensory Child Gets Organized: Proven Systems for Rigid, Anxious, or Distracted Kids you receive the only book that teaches the parents of “sensory” kids how to organize and empower their children for greater success at home, at school, and in life. With The Sensory Child Gets Organized, parents get an easy-to-follow road map to success that makes life easier—and more fun—for your entire family. As a parent of one of these kids I am always looking for resources to assist me in better understanding my daughter and resources for making our whole family life more structured and less tension-filled and sometimes explosive and this book helped in all of these ways. I was impressed with how the author laid out the book, as it allowed the reader to move from area to area without any issues. The book was systematically organized but allowed the reader to find the chapters that they needed and move around without feeling too bound to the linear chapter constructs. I have already tried to use some of these strategies and am seeing some results, and know that as long as I stick with it I should be able to see even more. The other thing that I liked in the book was that it provided the parent with ideas for leveraging the support given by care providers for your child with what could be done in the home, and all of this made perfect sense (at least it did for me). You can tell and feel the compassion that the author has for the parents of these children, and I for one appreciate this, as I know that I and many other parents of these children walk on egg shells daily trying to get through the daily life/routine that is set at home. If you are looking for practical strategies that can be put in place immediately, this book is definitely a resource that you will want to utilize! I highly recommend it to all!